The area itself is very green with many orchards of oranges and thousands of olive trees. The olives are just now ripening and I suspect this will be a very good crop year. From here we went up to the Palamidi Fortress which was built by the Venetians in 1714. The fortress is in amazing condition and once our guide explained all of the history and purpose of the fortress, we were able to wander around the expansive area and take some great photos. The smaller fort (Bourdzi Fort) on the island at the bay entrance was used in conjunction with city fortress and they actually used a huge chain between the small fort and the town entrance to keep invading ships at bay. The balance of our time in Nafplion was spent wandering the old port town, exploring the many shops, squares and tavernas. This is indeed a very quaint town and we would love to have more time exploring the area. Next stop – Mykonos! This was one of our favourite islands the last time we cruised the Greek Islands. The whitewashed buildings and the winding roads where we could get easily lost are all still the same. The 5 remaining windmills add to the charm of this amazing island. The weather was not the best being cloudy and overcast and some rain showers but it didn’t dampen our spirits as we ducked into the small shops selling their wares. However, our experience was a little disappointing as we had to fight the crowds that the 5 cruise ships in port inevitably create…didn’t they know this was out island for the day? Mykonos was also a little dirtier than we remembered but it is the end of the tourist season and I suspect they will spend some time sprucing it up for the next season. All in all, we highly recommend the island for anyone in the Greek waters and our biggest tip would be to find that perfect little taverna early before all the best seats are taken! This cruise is very port intensive and our next stop was Kusadasi, Turkey. Best known for the magnificent ruins at Ephesus, it is the area where the Virgin Mary spent her last days and passed away. The Ephesus site is only 10-15% excavated but what they have so far uncovered and reconstructed is breath-taking with its marble roads, the 2 storey library and of course the 27,000 seat amphitheatre. The amphitheatre was used for many concerts right up to about 5 years ago but the last 2 concerts (I think Sting was the last) with their loud music and the vibration created, actually cracked the foundation. No concerts are now allowed and repair work has been going on for 5 years. It is a wondrous place to visit and although we have visited before, it still takes our breath away! Kusadasi is also known for another great feature…SHOPPING! With its many streets lined with shops selling jewelry, carpets, leather goods, purses, watches, knock-off clothes and other “genuine copies,” shoppers can have a great time here. Be aware, the vendors are aggressive although very friendly for the most part. They love to negotiate and enjoy doing it. Many of the people we know on board came back with leather jackets (including us) that ranged in price from about $100 -$300 depending upon the quality of the leather and the style chosen. Hard bargainers got some great deals but the quality is superb and we know we will enjoy our jackets for many years! Today is a day at sea…finally! We love these sea days to get caught up on things like writing this blog, a good book, a dip in the pool or maybe a golf lesson. There is so much to do on board we sometimes forget the ship is every bit a destination on its own. Our last stop on the cruise is Istanbul tomorrow. Croatia – seeming to be the new and upcoming tourist destination, this compact little country has much to offer its visitors. We started our tour by leaving the charming city of Dubrovnik and heading inland to the beautiful valley of Konavle. It was here that we visited an old mill called Mlinica Dvori where the traditional production of flour using a system of watermills on the river Ljuta still functions. We were met by the owners and staff sporting traditional clothing and serving some traditional liqueurs and a style of grappa. All very interesting. After the old mill we stopped at the gallery of a local artist, who surprisingly, was much more interested in talking about old traditions and silk production than selling her works of art. Again, very interesting and well worth the stop. Then off to the old town of Dubrovnik, one of the most beautiful towns we have experienced. Unfortunately the weather was not in our favour and while we wanted to walk the 2km of the old wall, rain started to fall and we limited ourselves to the town itself. It was amazing to see how well the town has recovered from the devastation it saw in the early ‘90s in the war against Serbia and allies. A warm and fiercely proud city, Dubrovnik is a beautiful survivor. The next stop on our cruise was Corfu and our first stop in Greece. Since it was a national holiday, our shuttle bus dropped us off at a different spot than normal, except we didn’t realize it. Not that it mattered much except at the end of the day, we had some trouble finding our bus back to the ship. Good thing we left relatively early so we had plenty of time although it did cause us to do quite a bit more walking. Corfu has 2 old fortresses – an old fort and a new fort. Given where our bus dropped us, we visited the new fort which was relatively deserted but in very good shape. We wandered around for about an hour or so but as a result we missed the parade the town put on for their national holiday. None the less, we walked around the old town quite a bit looking in the many tourist shops and finally landed upon a restaurant located in a 500 year old building. My calamari was quite good even if the house wine was clearly home made. Several stops on the way but the 2 big highlights were Melissani Lake and Drogarti Cave. Melissani Lake was an underground lake whose dome fell in several years ago. We were rowed through this lake (not very big) while the Greek boat man explained a bit about the lake and sang to us. Quite neat. The Drogarati Cave was huge and although it seems that some of the stalactites and stalagmites have been broken off, it is still very impressive. The deep recesses are some 200 feet down from the cave’s ceiling. Today, we arrived in Athens. Although we have been here before, we were excited to go back to the Acropolis and view the Parthenon and other antiquities there. It is amazing to think that there are still structure standing from the 5th century BC. They are continuing to do quite a bit of restoration at the site but apparently they will complete their work in the next 2-3 years. Despite some scaffolding and a crane or two, it takes your breath away to imagine building such impressive temples back then. So this is our first attempt at creating a real time travel blog. 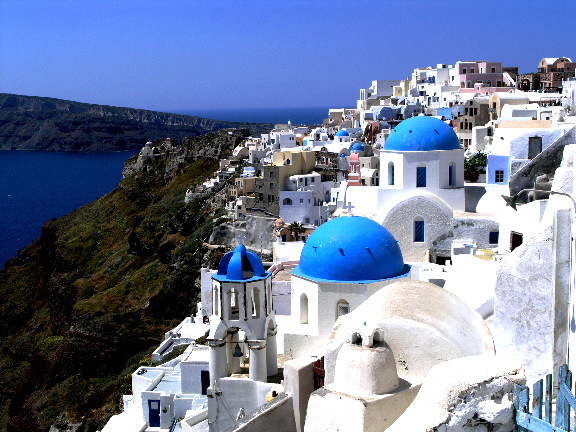 On Sunday, we are off to Greece, a small town on Santorini called Oia. Oia is well known for it fantastic sunsets and it’s romantic setting over the Caldera…an extinct volcano and possibly home to the legendary city of Atlantis. We visited this area a few years ago while on a Windstar Cruise and although we only spent a day on the island, we knew we wanted to go back. And we are…to celebrate my wife’s BIG Birthday. After our week on Santorini we will be off to the Amalfi Coast of Italy for a week and then to Venice for almost a week to explore all that this magnificent island has to offer. Check back often for our ongoing adventures.